The DFC Strategic Framework is a shared vision for Detroit’s future that resulted from a massive, citywide public engagement effort. It recommends a series of ideas, strategies and approaches on how to best use the city’s abundance of land, foster job growth and economic prosperity, ensure vibrant neighborhoods, build an infrastructure that serves citizens at a reasonable cost, and maintain the high level of community engagement integral to the long-term revitalization of Detroit. Detroit residents and civic leaders, from both the nonprofit and for-profit sectors, shared their work publicly at key points and shaped it in response to changing information and community feedback throughout the process. Detroit Future City (DFC) helps connect Detroiters with information and inspiration, as well as others who are working toward local resiliency. We are working toward a future where residents and institutions, local and national land use experts alike, are actively involved in the stewardship of Detroit’s land. 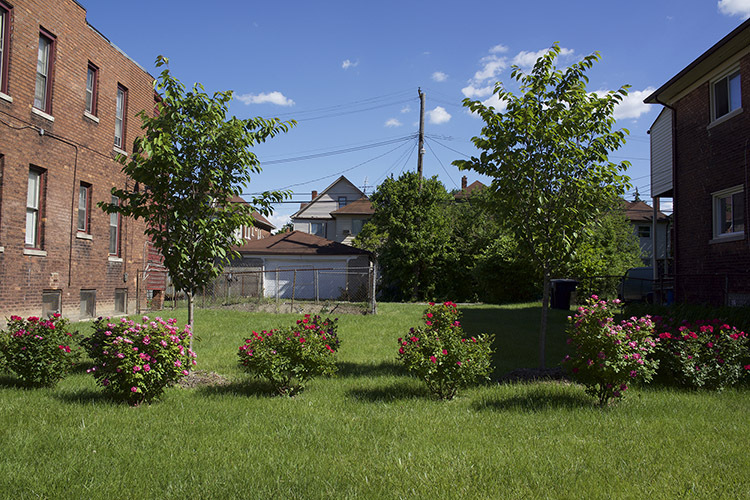 There are more than 120,000 vacant lots — comprising 24 square miles— across Detroit. While vacant land can be found in every neighborhood and has an impact on every resident, 72% of the city’s vacant lots are located in areas of concentrated poverty, which are defined as census tracts with a poverty rate greater than 40%. Detroit also has an aging water system that is often overwhelmed by increasingly frequent and intense severe weather events, leading to flooding in parts of the city. Transforming Detroit’s vacant land into an innovative open space network has the potential to foster a uniquely sustainable city that can create jobs with pathways to prosperity, provide physical and psychological health benefits, and improve air and water quality. Recently, a focus on the importance of managing stormwater has been uplifted by Detroit Water and Sewerage Department’s (DWSD) new stormwater credit program and investment in green stormwater infrastructure to address combined sewer overflow into our lakes and rivers. Green stormwater infrastructure in urban areas can help to reduce flooding and sewer overflows by absorbing large amounts of stormwater, both replenishing the groundwater supply and preventing the need for the water to be channeled through our sewers. Detroiters are critical partners in guiding vacant land transformation and assuring that land is an asset that promotes economic, environmental and social quality of life benefits for all residents in our neighborhoods. Advancing open space as a land use through policy change, public/private partnerships and publications. Supporting the eco-system of Detroit’s nongovernmental organizations to reduce stormwater overflows. Building capacity across sectors to scale vacant land transformation and measuring its impact. Detroit Future City (DFC) is dedicated to a long-term vision for Detroit built on equitable economic opportunities and outcomes for all Detroiters, and a diverse range of thriving neighborhoods for people of all incomes. DFC promotes strategies that meet the needs of current residents and support local businesses, while also attracting new residents and encouraging economic growth. More than 35 percent of Detroit’s residents live at or below the federal poverty line, and the median income for all Detroiters is less than half of that for the metro area. The number of jobs is growing, but unemployment remains high, and many Detroiters must commute outside the city for work. Creating economic opportunity for all Detroiters through business attraction, small-business creation, neighborhood-based enterprises, and workforce development will improve the quality of life across the city. 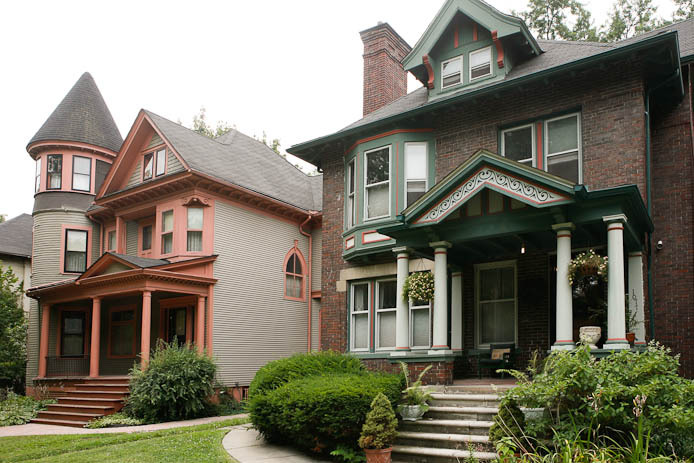 After decades of population loss, Detroit is stabilizing, even growing in some areas. High levels of vacancy remain across much of the city. Homeownership rates have fallen and the city now has more renters than owners for the first time in decades. Despite low property values overall, affordable housing remains a major challenge for many. Growing concerns about rising housing costs, and the potential for economic displacement, require pro-active strategies to preserve affordable housing and ensure inclusion. There are more than 900 vacant industrial buildings and thousands of vacant commercial structures in Detroit. Nearly a quarter of the city’s land is vacant. These buildings and properties present an opportunity for transformation. With innovative development strategies, some of these vacant buildings could be turned into economic assets that create jobs and wealth within neighborhoods. The development of walkable, higher-density, mixed-use communities can foster an opportunity to create a more sustainable and vibrant economy. Strengthen the service delivery system for developing, managing and improving the quality of existing single-family rental properties in Detroit neighborhoods. Design pioneering approaches for the adaptive reuse of vacant industrial properties. Improve racial and economic equity in entrepreneurship and strengthen local small businesses and commercial corridors. Strategies to move the framework forward.